New this year in our CSA program is a flower share from our newest Incubator Farm business, Betsy's Flowers at the Farm, and an Egg and/or Pork and/or Shitake Mushroom Share from Rising Locust Farm. These shares can be purchased as an add-on to your vegetable share or as standalone shares. Vegetable and Flower shares are available weekly or every other week. Egg and/or mushroom shares are delivered every other week. Pork shares are delivered once per month. You can choose to pick up your vegetable share at the farm on Tuesday or Saturday. We also have an off-farm Saturday pick-up location in York at Farm to Freezer (for vegetable shares only). Be sure to check out other locally produced essentials at Farm to Freezer's retail store. Again in 2018, we will partner with Kilgore Family Farm, one of our Incubator Farmers, to grow produce for the CSA shares. The Horn Farm Center CSA share contains fresh produce grown by participants in our Farming Internship Program and Incubator Farm Project. Everything is grown in ecologically healthy ways. We never use synthetic herbicides, pesticides, or fertilizer. By choosing to be a member of our CSA you are supporting aspiring farmers as they develop both horticultural and business skills. Your membership also helps to fund the Horn Farm Center as we work to connect our community to local food, to provide valuable educational classes and workshops, and to create a model of regenerative agriculture for our region. We have the following items on our growing schedule this year: Arugula, Basil, Beans, Beets, Broccoli, Cabbage, Carrots, Cantaloupe, Cauliflower, Celery, Cilantro, Cucumbers, Dandelion Greens, Dill, Eggplant, Garlic, Green Onions & Bulb Onions, Kale, Kohlrabi, Lettuce, Parsley, Peas, Peppers (Hot & Sweet), Potatoes, Radishes, Spinach, Squash (Summer & Winter), Strawberries, Sweet Potatoes, Swiss Chard, Tomatillos, Tomatoes, Turnips, Watermelon, various herbs, and more. Flower Shares will be provided by Betsy's Flowers. 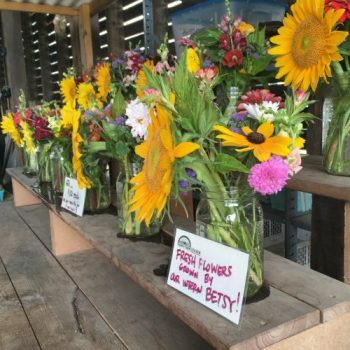 Bouquets are offered on a CSA (Community Supported Agriculture) platform, much the same as a vegetable CSA, but instead of vegetables, you will receive flowers. You buy a "share" upfront which helps the farmer to buy seeds and supplies. In return, you will receive 22 weeks of organically grown, fresh cut flower bouquets along with a Victorian "Language of Flowers" interpretation of your bouquet. A few of the flowers you can expect are: Sunflowers, Zinnias, Cosmos, Dahlias, Lisianthus, and Snapdragons. Your bouquet will arrive in a Kraft paper sleeve, all ready for your favorite vase or jar! Click here for Flower Shares! ABOUT OUR PORK: We raise our pigs by rotationally grazing them on permanent pastures. This means they have access to fresh grass, clover, insects, roots and occasionally nuts to provide a diverse and healthy diet. We supplement what they forage with a certified organic grain ration, vegetable scraps from our garden, and a little bit of spent brewers grain. Our husbandry practices mean that our animals are healthy and happy naturally so we don’t need to use antibiotics or other medicines. FULL PORK SHARE - $220 ~ 25 lbs A full share will be 5 lbs of pork chops, 5 lbs of ham, 4 lbs of roasts, 3 lbs of bacon, 3 lbs of sausage, and 5 lbs of other cuts! You will receive 5 lbs of pork in your share once a month. HALF PORK SHARE - $135 ~ 15 lbs A half share will be 3 lbs of pork chops, 3 lbs of ham, 2 lbs of roasts, 2 lbs of bacon, 2 lbs of sausage, and 3 lbs of other cuts! You will receive 3 lbs of pork in your share once a month. Click here to order Pork, Egg and Mushroom Shares. ABOUT OUR EGGS: Our hens rotate on our pastures following our cattle, sheep and hogs. They thrive on eating egg larvae, grasshoppers, spiders, insects, clovers, and weeds in our pastures. We supplement our hens with a certified organic grain supplement and a little bit of spent brewers grain. Our eggs have a deep, rich, orange yolk due to all of the healthy forage they have throughout the year! We raised a mixed flock of rhode island reds, brown leghorns, ameraucanas, and red sexlink hens which give the variety of eggshell colors in our eggs as well! FULL EGG SHARE - $115 - 23 dozen A full egg share will be 2 dozen eggs every other week in your share. HALF EGG SHARE - $60 - 12 dozen A half egg share will be 1 dozen eggs every other week in your share. Click here to order Pork, Egg, and Mushroom Shares. ABOUT OUR SHIITAKES: Our forest grown shiitake mushrooms are cultivated on hardwood logs in our creekside woods. They are an extremely nutritious food with well documented immune-boosting compounds and anti-bacterial properties. And they taste delicious!